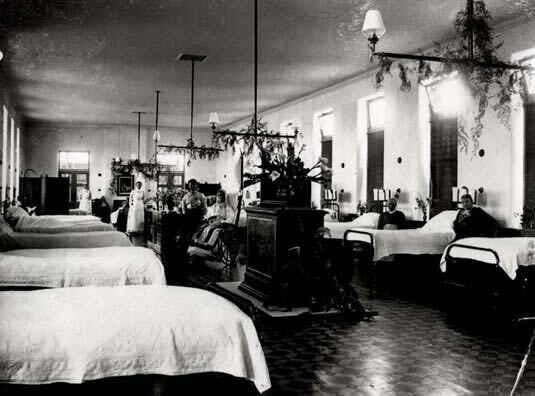 It was soon realised that accommodation for nurses was required, as well as a dedicated ward for the care of children. Thus within a few years of the opening of the hospital, the first of many additions was built. This was a two-storey block at the west end of the main corridor. On the ground floor was a ward for 22 children and upstairs was accommodation for 21 nurses. The building was completed in 1888. 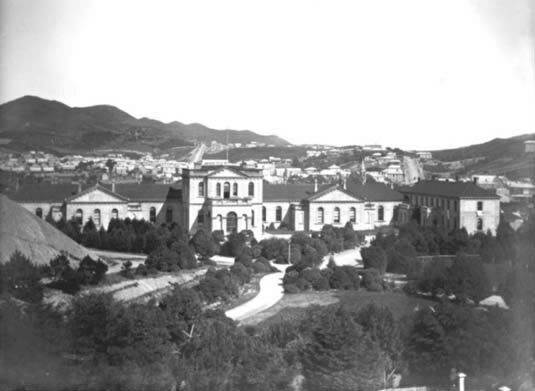 So this was how the hospital looked in 1890, with the new addition at the right of the photograph. By now there has been much growth in the gardens at the front of the hospital. It became clear soon enough that more beds were required to accommodate adult patients. Two more wards were planned, to be placed at the east end of the main corridor and extending to the north. These plans appear below. When the new wards were opened in 1894, they were named ‘Fraser’ and ‘Allen’ after two respected members of the hospital board. However, these names didn’t remain in usage very long and were replaced with the designation wards 5 and 6 . 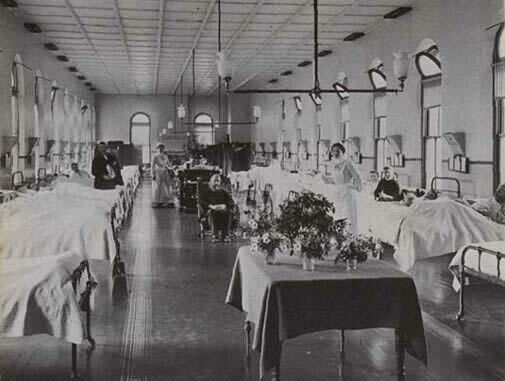 An early view inside ward 5 is seen here – it was originally used as a male surgical ward. This photograph was taken in 1897. The corner of the block containing wards 5 and 6 is seen in the extreme left foreground. 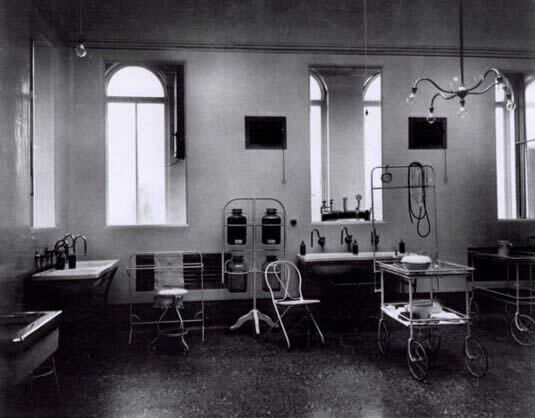 Surgery was originally performed in an operating / casualty room in the entrance block. By 1897 this had become quite inadequate. The medical staff met with the board chairman, following which an Operating Theatre committee was established. 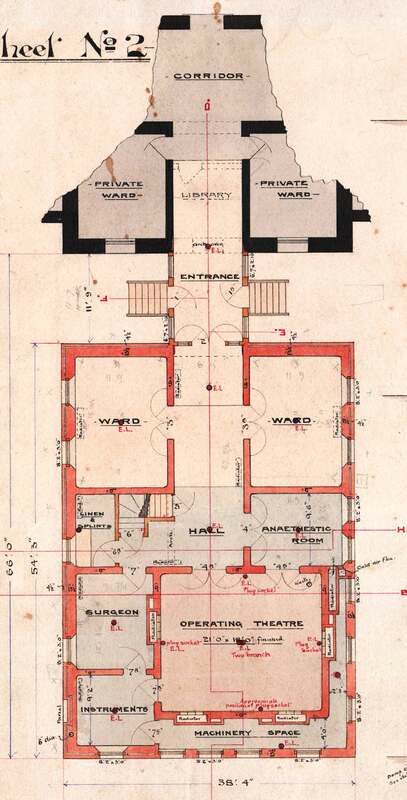 By September 1897 they had recommended that a new theatre block be sited between ward 5 and the two private wards to the west of the main entrance. However by January 1898 it was resolved to site the new theatre to the west of the main entrance block and in front of the private wards. The plans appear below. The construction of the theatre block is seen at left. The new theatre was opened on 20 December 1901 with due ceremony. Here we see some of the dignitaries in attendance. 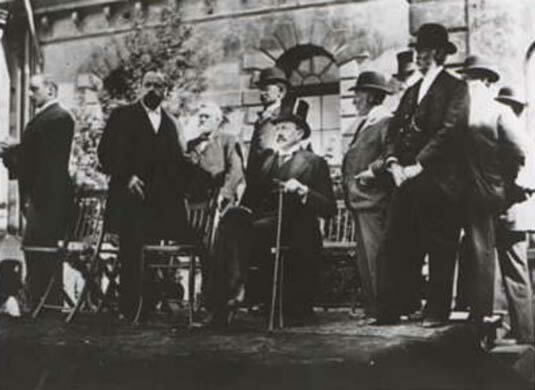 Seated is the Governor, the Earl of Ranfurly and to his right is the chairman of the Board of Trustees, George Webb. The building was named the Victoria Operating Theatre in honour of the Queen’s Jubilee. 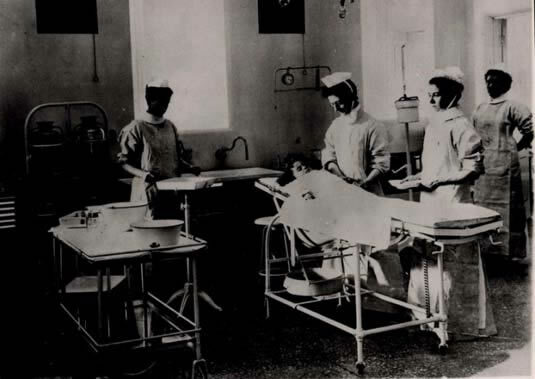 Two photographs below show the interior of the operating theatre in 1901 and in 1903. 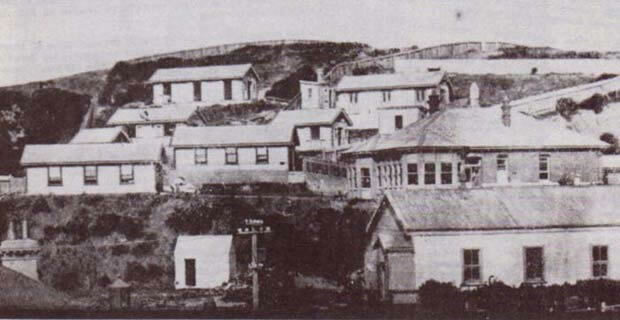 The completed block is seen in this 1901 photograph. Inevitably the expansion of hospital services was accompanied by an increase in the number of nursing staff who required somewhere to live. Accordingly a large nurses’ home was erected to the north-east of the hospital. It opened in 1904. 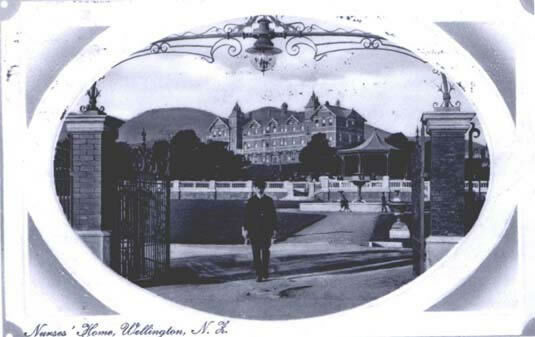 Here is another view of the nurses’ home as seen through the main gate which by now was situated on the Riddiford Street frontage. 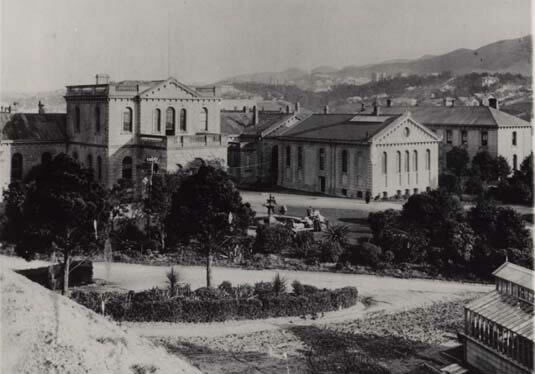 A significant number of hospital patients required long-term stay and to cater for them the Victoria Hospital for the Chronically Incurable was built on the hill to the south-east of the main hospital, near to Mein Street. There were two wards, the interior of one is shown below. Pulmonary tuberculosis had become a major health problem by the beginning of the twentieth century. To cater for the care of some of these patients, the Seddon Ward and Shelters were opened on the hill to the east of the hospital. They were opened with some ceremony in 1906 with the Hospital Trustees in attendaance. In the background is a covered way connecting the Seddon Ward with the Victoria Hospital. 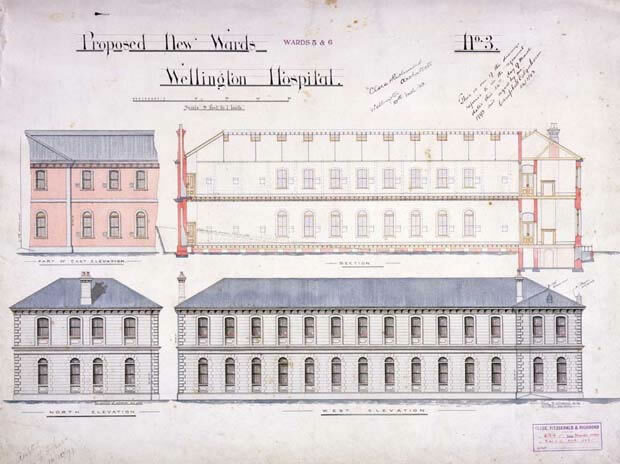 Toward the end of 1907, the Board of Trustees realised that instead of improving the Hospital by an addition here and there as required, it would be wiser to consider a comprehensive scheme of improvements, which could be undertaken by degrees. In early 1908, it was decided to invite offers of competitive designs. One of the specifications was that designs needed to include provision for a Children's Hospital. Also, designs should allow for development in stages but leading to an integrated hospital when complete. Many plans were submitted, and eventually, the first prize went to architects Messrs Atkins and Bacon. Sadly, their winning designs are not available. Despite selection of a winning design for future hospital development, no further action could be taken for some time because of a lack of funds, and the hoped-for integration of future developments did not occur. 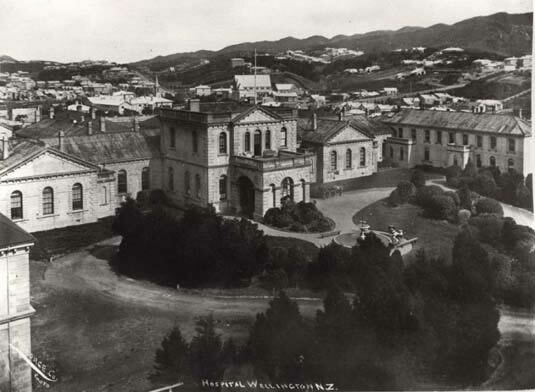 This photograph taken in 1910 looks across the hospital in a south-easterly direction. 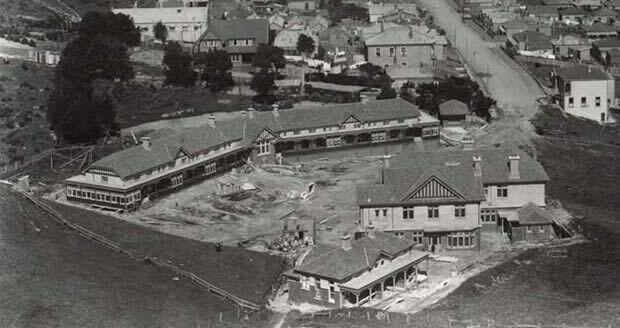 The Victoria Hospital and Seddon Shelters are visible beyond the main hospital. 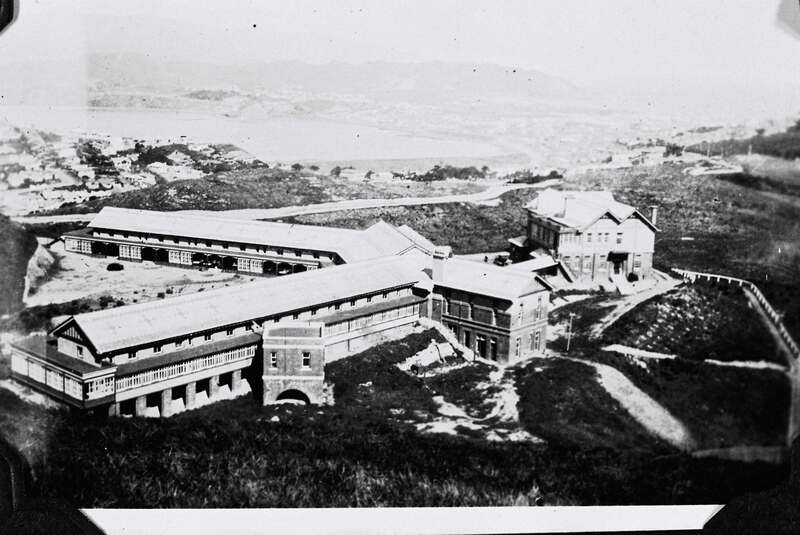 Another 1910 photograph looks across part of the hospital and shows a large unbuilt area to the west. The rather unattractive buildings leased by the Carrara Ceiling Company are seen towards Riddiford Street. Note the large white house in the foreground on Riddiford Street (with tradesmen up a ladder). This was where Dr Fred Bowerbank lived and practised at this time, though it would be a couple of more years before his appointment to the honorary visiting medical staff of the hospital. 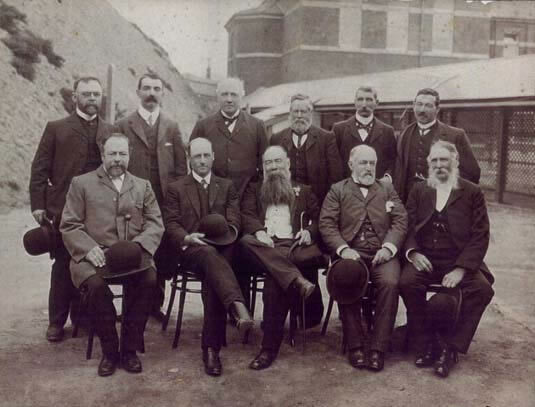 The building subsequently became the home and surgery of Dr William F Shirer and later was for many years the home of the ‘John Street Doctors’. 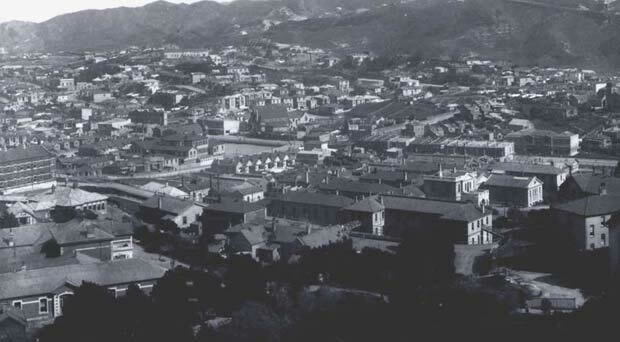 Another 1910 photograph looks across the hospital in a south-west direction and shows the increased development of Newtown by this time. 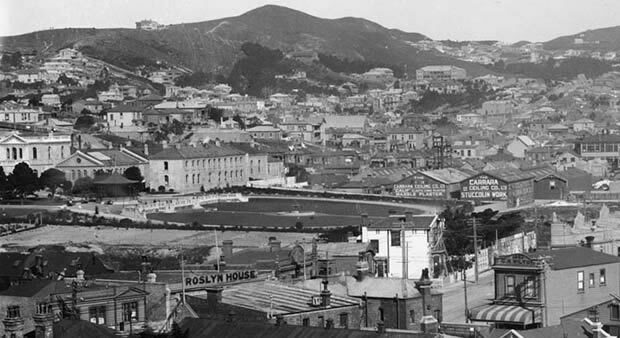 The Victoria Hospital is at the centre far-left of the photo. The Fever Hospital was opened in 1910. This wasn’t the first accommodation for patients with infectious fevers however. 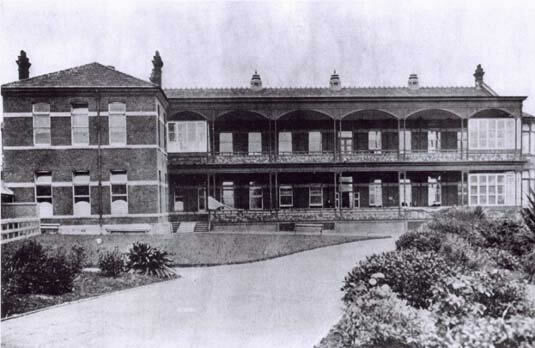 There was a separate eight-bed fever ward, remote from the main building, in Toxward’s 1881 hospital. 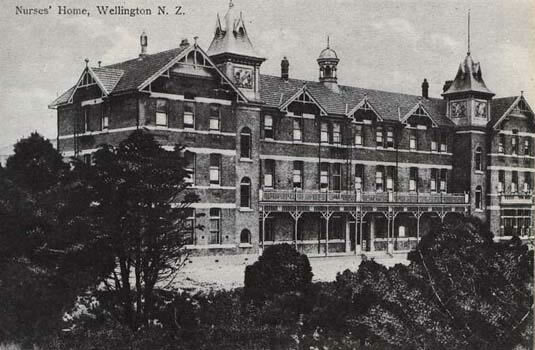 Then, in 1892 Wellington was hit by an outbreak of typhoid fever, and the “Hill Ward” housing up to 23 patients was hastily erected in corrugated iron. 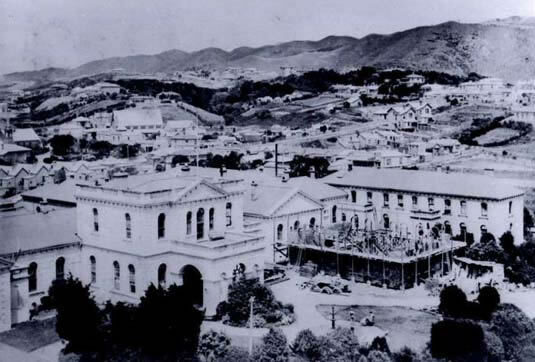 This photograph shows the Fever Hospital under construction. Access was from Coromandel Street and there was provision for a separate nurses’ home and administration block. The completed Fever Hospital, seen below, was later renamed ‘Ewart Hospital’ in honour of the very popular Surgeon Superintendent Dr John Ewart. With ever growing numbers of patients with pulmonary tuberculosis, the Seddon Ward and Shelters became inadequate. 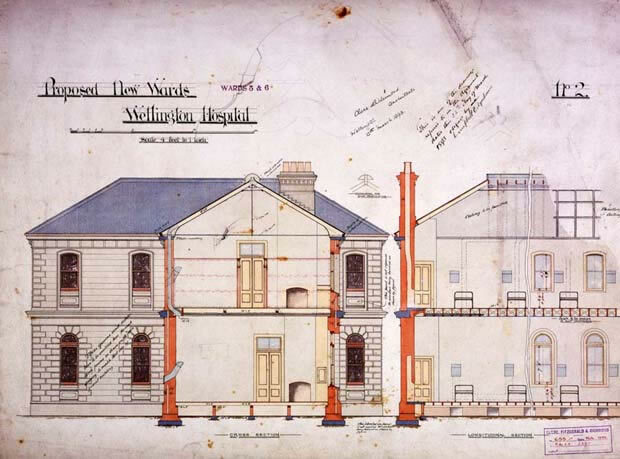 A second storey was added to Ewart Hospital in 1919 and tuberculous patients transferred to Ewart Hospital from the Seddon Ward and Shelters. 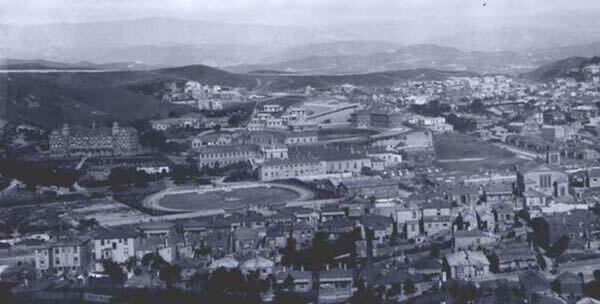 A new Fever Hospital was built right at the top of the hill to the east, opening in 1919. 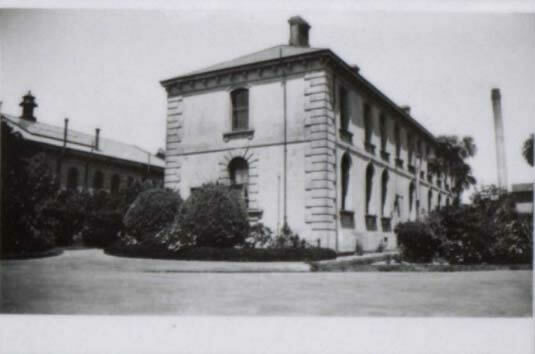 The photograph below shows the new fever Hospital as it was in 1926. Last updated 22 September 2017.